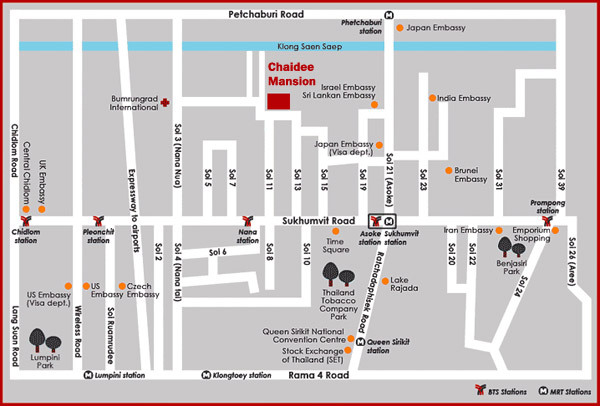 Chaidee Mansion is situated right in the center of Bangkok Sukhumvit, within walking distance to Bumrungrad Hospital, BTS Nana, BTS Asoke, MRT Sukhumvit, NIST School, and close to the expressway. The Mansion offers large luxurious apartment suites from studio apartments (55sqm), one bedroom apartments (60-90sqm), two bedroom apartments (200sqm) and three bedroom apartments (270-300sqm). Our apartments are available for both short term and long term stay. All of our 50-suites are fully furnished decorated with light wood interiors, modern amenities and kitchen facilities. 24-Hour security is provided with guards and CCTVs. Around the clock receptionist is there to provide you with quality service and assist you with any requests you may have. Families staying at Chaidee Mansion can enjoy our large salt-water swimming pool, children’s playground (outdoor) and playroom (indoor). Our customers can also enjoy our modern fitness room, sauna and steam room during the day. Large function room with a capacity of 100 guests is available upon request. Ample shaded parking space is provided for all units within our gated compound. Located in Sukhumvit Soi 11, Chaidee Mansion perfectly placed for a fine dining experience with major restaurants; Thai, Japanese, Arabic, Indian, Italian, German, just footsteps away from your room. Our Tuk-Tuk shuttle service provides great convenience for our customers travelling to nearby locations. Entertainment aside, key business and financial offices are also close by boasting six Commercial Banks within walking and the Queen Sirikit National Convention Centre just a short 5minute drive, or 2 stops away by underground train (MRT).